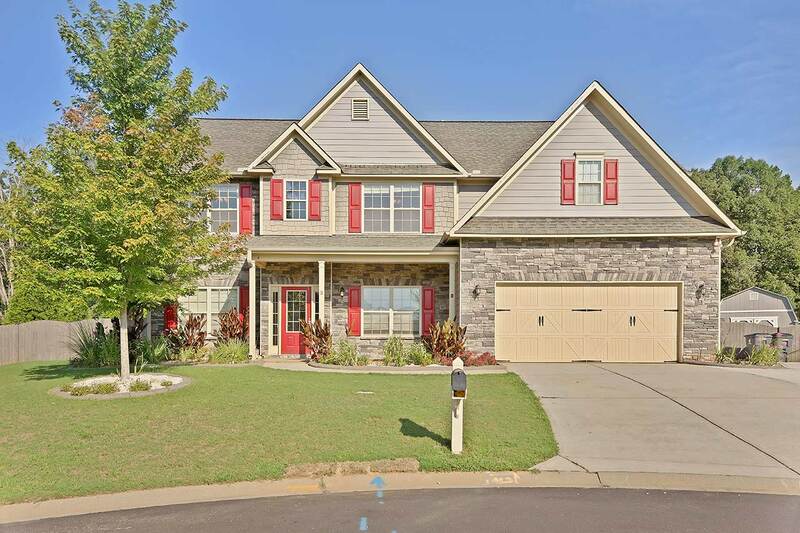 This excellent two-story home is nestled in a newer construction community in Simpsonville. Ravenwood – 031 subdivision is just minutes from the heart of Five Forks offering the best city conveniences – close to shopping, dining, other city amenities. This lovely home is perfect for anyone who wants space and a comfortable lifestyle. Two story foyer leading to the private study/office and large dining room. One bedroom with a full bath on the main level. Spacious living room featuring a gas log fireplace. The kitchen area features granite counter space, stainless steel appliances, tile floors, and large breakfast room. Master bedroom located on the second level featuring a sitting room and master bath with double vanity, garden tub, separate shower, and walk in closet. 3 additional bedrooms on the second level. An office/bonus room featuring built in shelving and sliding doors. Extended driveway that continues in to the backyard through the gate. 3 car garage capacity and an out building for more storage. In-ground pool for outdoor relaxation. Located on a quiet cul-de-sac lot, this impressive 5 bedroom home exudes stylish design coupled with 9 ft high ceilings, freshly painted color palette, and immaculate wooden flooring that was recently installed, in addition to all the other modern trimmings. There’s plenty of space to utilize in this spacious home for sale in Ravenwood. From the living room, dining room to the patio, there is space for every member of the family to come together or spend time apart. The spacious covered patio is great for entertaining. Inside or outside, there’s space for everyone to hang out plus the in-ground pool provides the perfect place to unwind on hot summer days.